Puhoi Market – Special event, tomorrow 30th April. This month’s market, on April 30, from 9am to 1pm in the Sports Club grounds, is traditionally dedicated to a celebration of all the varying nationalities and ethnicities which compose modern Puhoi. We hope you will continue the tradition by wearing a national costume or a flag or handing out some cultural cuisine to sample. The entertainment programme commences at 10am with Sue’s Indian cooking demonstration – egg curry – at 10am, a Puhoi Bohemian Dancers performance at 11am, the Puhoi Celtic Sessions musicians play at 11.30am and then we all join in for a British Sea Shanty singalong at midday. Alisa Schaffner is a 19 year old German backpacker looking for work in the Puhoi / Aruhoa / Warkworth area. Alisa has been woofing and staying in the same house as me in Ahuroa and the work has now come to an end. She has four weeks before she begins the next leg of her journey around NZ. Alisa has experience in vineyard work, waiting tables and childcare. She would also be happy to offer help with household chores, gardening, cleaning etc. Alisa has the option of continuing to stay where she has been woofing and pay rent, but would also consider woofing for another family if that was an option. Having witnessed her work ethic first hand and lived in the same house for the last month, I would happily recommend her to anyone needing extra help. You can contact her directly on mobile 0210344425. 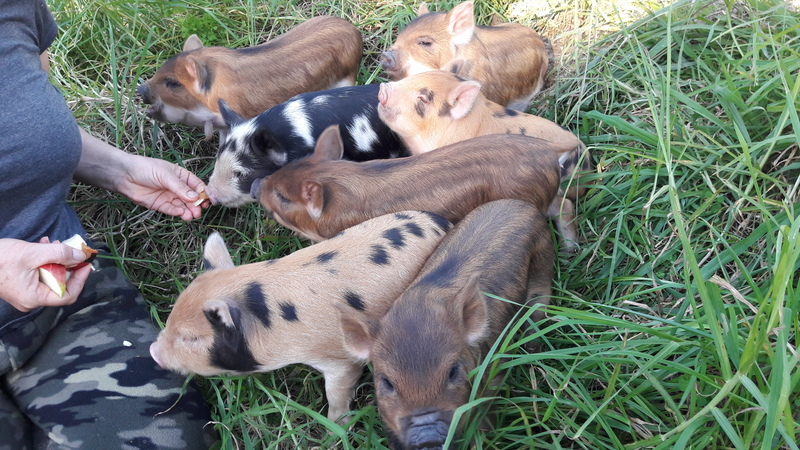 For Sale – 7 little Puhoi piggies. Kunekune mum ‘Rosie’s’ one night stand with itinerant wild boar has resulted in a gorgeous collection of piglets. Hand-reared for pets or fattening for your Christmas ham. They are 3 weeks old this Thursday and will be weaned between 7-8 weeks. Available then for $70 each. 2 males and 5 females (2 with tassles). Jockey wheel found in Komokoriki hill road. I put it next to number 33s letterbox (Richard and Denise’s). Black Lab/Ridgeback 2 year dog missing. Name Daisy, has tag and phone number on collar and microchipped. She wandered off on her walk this morning on Glen’s farm, Hawkens Rd, she may have gone into the bush and may come out Ahuroa Valley Rd if she is lost. Please phone Sandy or Barry if you see her. 422 5850.